Every year, Kentuckians across the state support their favorite team on College Colors Day. Although many focus on the big city, big money, big name schools, there are also many other very special division one schools throughtout the state. Growing up in western Kentucky, I can not help but get excited when the red towels wave in Bowling Green at Western Kentucky University. Sporting Hilltoper red on college colors day pays tribute to years of sports excellence by a little school in the hills of western Kentucky. WKU has been successful in various sports ventures, including “playing the the big boys” in the NCAA division one basketball championships. Coaches with storied histories, including Coach Jimmy Feix and Coach Ed Diddle have inspired countless players, students, alumni, and even everyday residents of the area. Diddle arena, named for Coach Ed Diddle, provides the small school with a great sports facility and has often been used to host state tournament games and other conferences. Western Kentucky University has one of the most beautiful college campuses in the state with hills and trees and a natual beauty that is second to none. The name Hilltoppers even comes from the unique landscape of the college campus. One of the most important reasons to wear Hilltopper red is Big Red himself. Years ago, fans started waving red towels in support of the WKU teams. From this tradition, a fuzzy smiling energetic creature unlike no other was born. Children young and even not so young, enjoy being hugged by the large red furball. Many fans also enjoy having their head disappear into the mouth of Big Red and posts of fans swallowed up by Big Red love can be found across social media. Even if you are not a Western fan, how could you not love watching such an adorable mascot? Whether a multi-generation alumni or just a resident of the area, Western Kentucky pride runs deep. 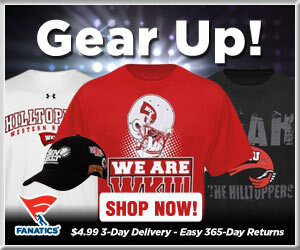 A small school with a big heart and a fantastic tradition of competitive sports teams, Bowling Green’s Western Kentucky Univeristy deserves the support of wearing Hilltopper red not only on College Colors Day but every day. We are blessed to have a school with red towel wavin’, Big Red lovin’, campus hill climbin’ students both past and present located in western Kentucky… Once again, proving that not everything great in the state of Kentucky comes from the big cities!